Nearly twenty years ago, while preparing to move to remote Alaska with my first husband, my stepmother asked me “How can you even think about moving so far away from your family and other people you love?” At the time, the calculus of my love for and connection with the land weighed more heavily than my connection to people, and I didn’t understand her question. I shared with her an essay written by Barry Lopez, “The Bend” from the book River Notes. The narrator of this story falls into a deep depression while trying to find the measure of a river through scientific and mathematical means, and eventually he makes peace recognizing how inseparable he is from the land itself. That deep connection with the land feeds my spirit; it drove me out of the city and deep into the northwoods: Minnesota in my twenties, and later, Alaska. Connection with other human beings is also important, however–it’s well-recognized as a protective factor in depression. I’ll admit I underestimated just how important human connection was, and is, in my own life. The American Psychiatric Association website describes depression as a medical condition lasting two weeks or more, that affects feelings, thoughts, and actions. Symptoms include feeling sad, losing interest in activities that brought pleasure in the past, changes in appetite, sleep, energy, thoughts; feeling worthless or guilty, difficulty concentrating or making decisions. At its worst, thoughts of death or suicide emerge. Although medical causes exist, depression is usually a result of complex biological and social factors, some of which the APA website outlines. Writers and artists and storytellers can teach us as much about the world as scientists. This post focuses on a few books by northern authors that explore the interacting ways that disconnection and isolation feed depression. It explores some of the cultural nuances of what it means to feel ‘connected.’ And it highlights a couple of books that explore the importance of our connection with the land, with place, as an integral aspect of our community and mental health. Looking back to before the move to Alaska, what I did not yet understand about my reasoning for moving to the woods,was the role of isolation and disconnection in depression. Ultimately, however, these were the same factors that brought me back out of the woods. Isolation from other people was one of the biggest challenges I faced while living remotely. Edges of the Earth by Richard Leo chronicles the story of a couple moving to remote Interior Alaska from the lower 48, building a log cabin, having a child, and breaking up. Lonely and depressed during the experience of building the cabin and bearing their child, his companion eventually moves to the nearby community and makes her home there, while he stays in the woods. Despite having read this book long before my move north, I was unprepared for the emotional experience ahead. During the spring and summer of building our cabin, we had visitors from the local village upriver, as well as the company of a cheerful young man from Minnesota who was helping us to bring in the logs for the cabin. After he left, my mother came out for a few weeks, and helped haul water, enjoy the daily rainbows arcing across the lake, eat fish, do dishes, swat mosquitoes, and laugh with us along the way. Then she went home. By fall, it was just the two of us. When disagreements arose during freeze-up, there was no escape. No way to call anyone by phone for reassurance. No one to distract us from each other, make each of us laugh and move on, let go. I could not reach out to my friends from our previous community, and even if I could have left to go visit with someone nearby, I did not know anyone very well. So the two of us spent a lot of time not talking, with no one else to interact with, for weeks. Freeze-up came late that year (as it has been many times since I moved to Alaska). Finally, it was late November. Time to leave for the winter. Our plane would come to the village downriver to pick us up the next day. We would have to drive a full day by snowmachine on unbroken trail to get there. The afternoon before, I had listened to the VHF radio, terrified, as the pilot flying overhead warned us that the river was still open downriver, that the river that was always frozen by mid-November was still open. But we could not wait any longer and still catch our plane. The land’s quiet hints, and the clamoring western schedules, collided. Just as we got out to the main trail on the river near our home the morning we left, my husband had put his hands on my shoulders to turn me to face the pink sunrise. “Look. Look at that sky. That’s why we are here. That’s what we will come back to.” It was beautiful. And, it was all, just a little, too, much, cold, lonely, reality. We drove our snow machines over forty miles that day, breaking open the back trail. We traversed rough gullies, got lost a few times on the many criss-crossing trails that increased as we approached the village where the plane would pick us up the next day. After a month of isolation, and a long day of winter travel, we finally found the river near dusk. The water was open on both banks, as we had been warned. I could see the lights across the river at the B & B, representing the warmth of people–friends! I was terrified to take the machine across open water for fear I’d fall in and never get there. Yet there was no going back. Leo’s book proved a harbinger, in that he described the departure of his wife due to loneliness, her desire for human community. I loved the land at Morrison Lake and felt that connection deeply. It was difficult to leave the place. Ultimately, however, the isolation from humans became enough of a problem, that I moved out to a nearby village, in order to have a more robust human community. Over the next ten years, I remarried, had children, worked in the clinic, volunteered in the community. Through that time, I felt mute about those freeze-up memories etched in my body; I could not find the language to explain what I had observed and felt; the cumulative experience. Bits and pieces came out over the years, Some people knew what questions to ask. Some just made gentle comments reflecting understanding. I learned that my experiences as an immigrant to rural Alaska were not unique. A Story of American Transience: Alienation . . .
For many people who grow up and remain in rural Alaskan villages, love of land and culture and subsistence food holds them, in combination with ties to family and community. Deep connection, with each other and the land, sustains communities through significant traumas. For individuals moving to remote areas from outside of Alaska, such ties must be forged, and isolation can be an immediate problem. Without other people around to provide emotional support, a change in perspective, and laughter, it’s all too easy to spiral off into a distorted perspective. This is the darker side of what I learned from my time in a remote location, and this is what I appreciate about David Vann’s writing. His early work Legend of a Suicide tackles his struggle to understand his father’s suicide. He describes his father through various stories as a man alone, unable to truly feel connection even with those he loves the most. “I haven’t felt at home for years, haven’t felt a part of any place I’ve been. Something’s been missing . . . ” (p. 47). He goes on to describe a man unprepared for the wilderness he retreats to, a white man privileged by education and profession; arrogant, impulsive, unable to learn from his mistakes: his lack of deep connection with any person or place are flaws that lead ultimately to tragic outcomes.
. . . and Arrogance. 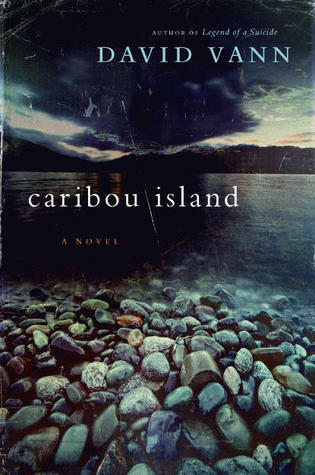 With a later book, Caribou Island, Vann again uses his early life experiences to craft a story that accurately grasps the kind of uniquely American alienation that leads down such a path of emotional destruction. It’s literary; the spell never lifts from beginning to end: I was hooked from the first two pages with the accuracy of the descriptions of the land and the people, all of whom were immigrants to rural Alaska. What’s important about this story is how well it captures and paints the way isolation and alienation interact with mental illness: The dream many men, often white men, have of moving to remote Alaska, of getting away from it all, often reflects a diminished capacity for emotional reciprocity–narcissism, if you will–and the cost, in terms of relationships, takes a toll on everyone around them. The same failure to hear and understand the emotional needs of those closest to them, extends to their inability to respect the land’s hints about how to survive. A fundamental flaw in all the characters of this story is their lack of more than a surface connection to each other, lack of any purposeful connection in their lives. The tragic conclusion pulls on the reader to understand the cognitive distortions born of isolation and depression and how they feed off each other. After reading this story and its foreshadowed conclusion, I remembered standing at the riverbank all those years ago, looking for solid ice at the edges and not finding it. I finally understood that crossing that river had been important to my survival in many more ways than I had ever imagined at the time. I reached out to hug my family for a long time, after I finished reading this book. Thinking back to my stepmother’s question about how I could move so far away from people I loved, I realize now that my family of origin and I, myself, both failed to understand the complexity of ways that I already felt disconnected before I moved to Alaska. In writing this post, I looked through my old files and read through notes I had written about depression from the years before deciding to move north from our Minnesota home. I noted the many disconnections, all risk factors for depression. After graduating college, my friends and I had all moved in different directions. I had held a string of seasonal jobs, and did not have a routine workplace community. One of my closest friends had a psychotic break and moved away, back with his family, due to severe mental illness. Two other close friends, who had sheltered me during difficult times, had also moved out of the state. My mother had nearly died, and although I had spent a month back in California trying to help her, much of the rest of our family and community had been distant and preoccupied with their own lives while she was in the ICU. After she had physically recovered, my mother continued to flounder emotionally. Far away again in Minnesota, there was little I could do to help. All of these memories were still fresh on my heart when we decided to move. I recognize now that my stepmother perceived me as having strong ties with family and friends. However, I perceived those connections as threadbare. My own sense of isolation preceded depression and fed it, and in turn, I retreated further. I see now how this contributed to the decision to move north. While I identified the very positive connection with the land I would be going to, I failed to understand how isolation from my human community contributed to my retreat, and how that sense of isolation would be exacerbated by the move. Eventually, however, the sense of isolation from humans, more than anything else, lead to my coming out of the woods. I continue to find stories that help me understand the distortions of thinking that happen among immigrants to rural Alaska. In The Raven’s Gift by Don Rearden, a dystopian post-epidemic novel set in the Y-K Delta, Red is a character who emerges late in the novel to tell us, “I’m plumb tuckered out. You wouldn’t understand it, but I spent a good majority of the last thirty some years planning and preparing for the world to end. When it did, I was going to be ready with guns a-blazing. Wasn’t going to want for nothing . . . But I didn’t ever want it to just be me all by myself.” (p. 138) The arrogance of working toward surviving alone ultimately defeated the purpose of survival itself. Connection in community is necessary for mental health. While biological risk factors exist, depression is often the result over time of disconnection from people, place, or both. Major identified environmental risk factors for depression reflect this, such as loss of a loved one whether by death, illness, or separation; a change in job or financial circumstances; a major move. All represent disruptions to the ways we are connected to, and in relationship with, others in the world, whether people or place. Suicidal thinking and behavior can represent the nadir of depression, and when this happens, thinking has often become distorted over a long period of time leading up to it and resolution requires time, to redevelop connections that provide a safety net. Many factors, including trauma and abuse, grief and loss, sleep deprivation, substance abuse, easy gun access, and increasing use of electronics displacing traditional activities, contribute to Alaska’s and the nation’s current epidemic of suicide. The roots of depression, however, lie in this lack of connection. Many Alaskans understand that deep sense of connection with the land–either by birth and culture, or by experience after moving here and participating in subsistence activities. When I ask someone about fish camp, and her eyes light up and dance at the memories, I know she feels that connection. Fish camp engages all our senses. People work with their hands to take care of their winter food supply, interact with extended family across multiple generations, and enjoy the peak of the fleeting warm season together. I never take this connection for granted, however. I have learned through my years living in rural and urban Alaska, that not everyone in Alaska has been to fish camp, not everyone feels this sense of relationship with the land. The culture of consumerism increasingly leaves people disconnected from understanding the source of their food, heat, and water–and each other. Some people move to rural Alaska without a deep sense of respect and listening. Those who are unable to establish and maintain deeply felt connection with either the land, or people, or both, are most vulnerable to the cognitive distortions of depression. In the American Psychiatric Association’s 2017 report on Mental Health Disparities: American Indians and Alaska Natives, a section on the Cultural Health Practices of American Indians/Alaska Natives discusses connection with the land and history as part of traditional healing systems. “These systems focus on balancing mind, body, and spirit via a connection with place and land.” The report goes on to suggest that connection with culture, family, and the past are important protective factors in AI/AN communities. I find this quaint. Western culture’s fascination with transience and lack of attachment to place plays a role in our current mental health crises nationwide, not just among indigenous communities but among all who have been displaced, voluntarily or not. Indigenous writers and healers are known for emphasizing the importance of connection to place, and I’m glad that the APA is recognizing the significance of this to mental health in AI/AN communities. However, that sense of connection–not just to people and community, but also to place, the visceral sense of knowing the soil and plants and animals that sustain you–is important for the rest of us to honor, as well. In an era of mass migration, we ignore the importance of connection to place as well as people at our own peril. Not just our mental health, but our very lives, depend on understanding how we are connected to the land as well as to each other. In The Man Who Heard the Land, author Diane Glancy presents a story told from a distance about a middle-aged professor bumbling along who starts listening to the land as it communicates to him. He has taught environmental studies from an academic perspective, but starts to feel and sense a much deeper connection with the land through the course of the story. Through this connection, he realizes his choice to not bring anyone into the world “. . . was an indication of his not taking part. It was a shrinking back. A cowardliness.” The narrator reports “He wasn’t heard in department meetings, just as the trees and hills and the sky weren’t heard.” As he progresses through various experiences which require him to step out of his professorial suit and engage directly with the land and family and other people, he begins to accept some of the grit. “But the important lesson was the work and dignity and endurance it took to live.” Through connecting with the land, with his hands, and his heart, he is better able to connect with his family, and matures as a human, accepting responsibility for his own place in history. In Gathering Moss, Robin Wall Kimmerer explores the web of reciprocity that is the understory to the forest, She asks, “What are the conditions that foster diverse communities rather than isolated individuals?” (p. 2), and observes, “Moss plants almost never occur singly, but in colonies packed as dense as an August cornfield. . . The more tightly packed the shoots, the greater the water-holding capacity . . . Separated from the rest of a clump, an individual moss shoot dries immediately. . . Mosses without such a favorable design dried out too quickly and were eliminated by natural selection.” (pp. 38-39) She looks at the relationships in this overlooked forest at our feet and considers whether modern humans have missed something important: “Mosses have an intense bond to their places that few contemporary humans can understand. They must be born in a place to flourish there. Their lives are supported by the influences of previous generations of lichens and mosses, who made the rock into home. In that initial settling of spores they make their choice and stick to it. Relocation is not for them.” (pp 130-131.) Kimmerer integrates her perspective as both scientist and indigenous American to remind the reader that connection, not separateness, is the natural state of life in the north, and we disrupt these connections at our own peril. It’s a message that we all need to heed. I remember parking the snowmachine at the well-lit B & B, and taking a moment to walk back to the river after I had crossed it. I looked back into the darkening night, at the light reflected off the snow and ice in the center of the river, the darkness of the river edges where the ice didn’t hold. I had spent most of the past month silent and alone, with my husband under the same roof, the roof we had just put up together, on the log cabin. I had cooked, hauled water, done laundry, hauled firewood, taken bucket baths. I had read books, tried to write. I had eaten moose meat and blueberries. I had tended the woodstove and baked bread. The land was beautiful, and I had done many of the things I had set out to do, dreamed of doing, in remote Alaska. But my husband and I had hardly spoken. For the previous month, I had felt alone, and the land could not, by itself, comfort me enough. I wanted to never be that isolated again, ever. I returned to the community of humans. In the years to come, I would provide health care for a small community, visit with elders, be present at the most vulnerable moments in many people’s lives. I would remarry, and bear two children. I would sing with the community in celebration at festivities, share salmon and moose meat and berries. I would observe how arrogance and disconnection could cost lives in a harsh climate. In Barry Lopez’s essay referenced at the beginning of this post, he states “from above, to a hawk, the bend must appear only natural and I for the moment inseparably a part, like salmon or a flower. I cannot say well enough how this single perception has dismantled my loneliness.” It’s through participating in a community, both human and non-human, through listening and reciprocity, to both humans and the land, that we survive and feel connected. Stories of Alaska in the last centuries include changes to indigenous culture wrought by immigrants from many places and the importation of cultures of separateness–individuals who come to take from the land. Ultimately, however, surviving and thriving in rural Alaska, no matter your background or location, requires connection and community. Traditional fish and hunting camps embody this spirit in amazing ways, but are not necessarily an immediate part of the culture of immigrants to Alaska. Rural homestead families who remain in remote locations, know who their neighbors are, and understand the limiting nature of isolation. The occasional loner who gets dropped off way upriver, may later find he was the subject of discussion on community message boards until his safety and whereabouts were verified. Those who remain in rural Alaska understand the importance of community, no matter how remotely they live. Depression and isolation in rural Alaska is a complicated subject. As important as human connections are, deep connection with the land is often overlooked as another important protective factor in mental health, not just for indigenous people but for all humans. When that connection is disrupted or never truly develops, mental health and connection with other humans suffers as well. Good mental health benefits from a broad understanding of community and a reciprocal relationship with more than just humans. And, there are many more aspects to depression than what this post covers. What are the stories in the north that have helped you, the reader, understand isolation and depression? What are some of the other facets of Alaskan mental health challenges that art and literature has helped you better understand? What are some of the stories of healing and connection in the north? How can connection to both other humans and the land, be maintained and nurtured in our modern world? How are these issues of isolation and depression playing out in our modern world, and how can we address them? How important is it to address this connection with the land when working with individuals who are depressed, especially in Alaska? I invite your responses in the comments below. If you or someone you know is depressed and in need of connection, please reach out to your loved ones. If needed, several resources are available to you online, listed on the resources page.